The idea of a museum for Storrington has been discussed at various times since 1946, but it has only been in the last year that something has actually materialised. Thanks to the supreme efforts of local historian Joan Ham and her husband Ron, and the enthusiastic support of David Garrett who conducted a feasibility study for the parish council – and until recently Chairman of the Museum Committee – premises have been found in less than a year from the date of the first public meeting. The original intention of Storrington Parish Council was to purchase the freehold of 13 Church Street, which would have provided a location close to the village centre, but due to legal complications this was eventually rejected. Instead a room was offered at the Old School, which has certain advantages as far as car parking, toilets, kitchen facilities and disabled access are concerned. Although the premises are not ideal in terms of size and the lack of storage space, they are a very useful start until something more permanent can be found – hopefully at some time within the next five year. And so, on Easter Monday, the new Museum room at the Old School Building in School Lane, opened for its very first visitors. Now it is up to all those involved with the project to make it a success because only by attracting the support and enthusiasm of the general public will the parish council respond favourably when the time comes to consider a new location. Certainly there is a very active ‘Friends’ organisation who have run a well-supported winter lecture programme; for the Summer months a series of local walks have been arranged to reveal some of the fascinating history of the parishes involved. Why am I telling you all this, you may ask? Firstly, as Secretary of the ‘Friends of Storrington and District Museum’ I do have a vested interest in the new project. But as a family historian, it is significant to our group that all of the parishes covered by the Museum have important Lin(d)field connections. Take Storrington, for instance: Edmund Linfield was making brass dial clocks in the village from the 1750s (see article " Edmund Linfield of Storrington, Clockmaker" in ‘Longshot’ Vol. 6 No. 1, December 1997), and there is a superb example of his craftsmanship now on display in Horsham Museum. He lived in the village from at least 1753 until his death in 1799, when he was sadly an inmate of the local workhouse. His kinsman, Peter Linfield was the local butcher, moving to the village from West Chiltington in 1779 when he set up his butchers’ business in Church Street (see article "Peter Linfield of Storrington 1734-1791"in ‘Longshot’ Vol. 2 No. 1, May 1993). He still retained ownership of his farm and farmhouse in West Chiltington – called ‘Palmers’ -which remained in the family for many years. Although Edmund and Peter both ran businesses in the village, their fortunes ran in opposite directions: whilst Peter thrived and his business grew from strength to strength, Edmund’s eventually failed, possibly because there was nobody to carry on when advancing age forced him to give up. The other parishes involved in the project presently include Sullington, Parham, Thakeham, Warminghurst, Washington and West Chiltington. Thakeham, of course, is still home to the mushroom business known as ‘Chesswood Produce Ltd.’ In 1913 AG Linfield and Sons of Worthing first acquired the land at Town House Farm where they set up a number of farming activities, including mushrooms, which in those early days were a risky but worthwhile crop because of the high prices they could command (see article "A Family Business" by Peggy Champ in ‘Longshot’ Vol. 3 No.1, May 1994). 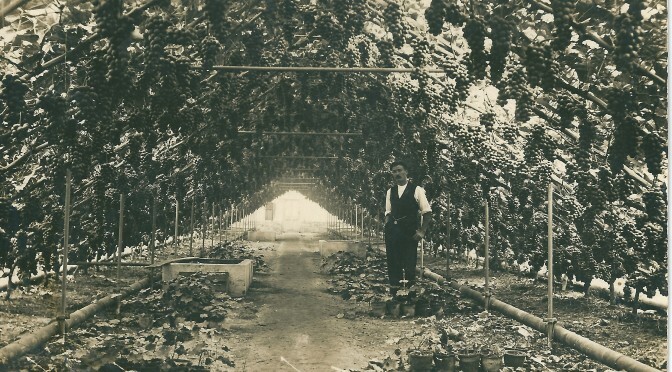 They became a large market gardening business, but after the Second World War mushroom growing expanded dramatically as cultural improvements and extensive mechanisation heralded a new era of prosperity. By 1960 they had become the largest mushroom growers in Europe. The firm ceased to be a family business in 1980 when control initially passed to Ranks Hovis McDougall (RHM). I intend to set up a museum archive which should help to reveal more of the history of a business which has played a prominent part in the local area. It will hopefully pull in more material as people gradually become aware of its existence and make their own contributions. The former parish of Warminghurst (now part of Thakeham) was for many years the home of the famous Quaker William Penn and his family (see article "William Penn and the Quaker Linfields of Sussex", in ‘Longshot’ Vol. 3 No. 2, December 1994). Penn bought Warminghurst Place in 1676 and we know of at least one Linfield Quaker marriage taking place at his house, when John Linfield, Blackskmith of Ifield married Mary Wolvin in 1693. At the ceremony, the parents of the groom, William and Mary Linfield of Horsham, and his brother and sister attended. Warminghurst Place was situated between the two churches of Thakeham and Warminghurst, and was sold to James Butler in 1707. Butler disliked Penn so intensely that he promptly demolished the old house, even going so far as to dig up the very foundations so as "not to leave a trace of the Old Quaker." In previous articles, our former President Eric Linfield has related his family history connections with Sullington and Washington (see articles "The Storrington Linfields & their Poor Relations of Sullington and Washington", Part 1 in ‘Longshot’ Vol. 2 No.2, November 1993 and Part 2 in ‘Longshot’ Vol. 3 No. 2, December 1994). Eric relates how his great great great grandfather Edward (1774-1861), who was a younger son of Peter Linfield of Storrington, left the village in his youth and moved to the neighbouring parish of Sullington. Coming from a large family, it was understandable that younger children often had to move away from the parish of their birth and find work elsewhere. Initially, he carried on his father’s trade as butcher, but by 1841 he is running a 3 acre market garden at the crossroads junction where Water Lane crosses the Storrington to Thakeham road. His son Peter (1810-68) joined him at the market garden, whilst his other sons Harry and William worked locally as agricultural labourers. Harry (1807-78) was Eric’s great great grandfather and completed 50 years service working for the Carew-Gibsons on the Sandgate Estate. We are extremely fortunate to have a surviving photograph of Harry, wearing the traditional smock of the Sussex labourer (reproduced in ‘Longshot’ Vol. 3 No.1, May 1994). At the last count, there were over 1600 catalogued items and photographs in the museum collections. Now it is open, many people are bringing things along and it is an exciting time as the collection expands. I think it is important to establish a Lin(d)field archive at the museum because we are a family with particularly strong and long standing connections with the parishes involved. If anyone would like to join the ‘Friends of Storrington and District Museum’, then please get in touch with me and I can send you a membership form – the cost is £5 per annum for individual members or £7 for family membership (two adults and any dependent children living at the same address). It is probably worth finishing this article with the words of Joan Ham, taken from the January newsletter: "Storrington and District Museum will not be a dull collection of things in glass cases. We intend to make it a living part of local life. Displays will be changed regularly. Neighbouring villages which make up the "and District", will be invited to contribute. The proximity of public rooms means that we can welcome school and other parties with an introductory talk, or stage temporary exhibitions . . . The new year and the new millennium will see the beginning of an exciting new project that has been discussed and wanted for the past half-century. Now we can make it happen." In the light of all the celebrations and expenditure surrounding the start of the year we call 2000, it is easy to forget just how arbitrary our system of numbering is, and how artificial the so-called millennium really was. Because we count in tens, years that end in a zero tend to acquire a significance in our lives. If they end in two or even three zeros they appear even more significant. On my 50th birthday last year, we had a party. No such party marked the 49th and I doubt that one will mark the 51st. Yet whilst such years provide a good excuse for a party, their significance is a direct result of our having evolved with ten fingers. It is interesting to consider which birthdays we would have celebrated had we evolved with four digits on each hand. Assuming that we had adopted a counting system using a base of 8, perhaps the big party would be on reaching 100, which would equal 64 in our system of counting. Not only are these events an arbitrary effect of our counting system, they also lead us to celebrate a year too early. As most of the pedants in the world have pointed out at some time in past few months, the century, and the millennium, end on 31st December 2000, when 2000 years will have passed since the point which marks the start of the Christian calendar. However, such protestations of mathematical accuracy have been drowned out by the sound of the celebrations! This point in time, which supposedly marked the birth of Christ, is itself the subject of considerable inaccuracy. It was calculated originally in about 535 A.D, when a scholar called Dionysius Exiguus (500-560) calculated that Christ had been born 535 years previously. At this time, dates were expressed in terms of the time since the founding of Rome, which they placed in the year we call 753 B.C. They called that year 1 A.U.C., which stands for Anno Urbis Conditae, meaning “the year of the founding of the city”. This system was used in Europe generally, and had it remained in use, would have led us to celebrate the year 2000 in what we call 1247 A.D.
About two and a half centuries after Dionysius made his calculations, Charlemagne, who ruled much of western Europe, decided that it would be much more pious to count the years from the birth of Christ, rather than the founding of the heathen city of Rome. This system spread through Europe, and from there was imposed on most of the rest of the world as European countries discovered and colonised other continents. Although other calendars are retained as part of various religious ceremonies, the Christian calendar remains the standard to this day for all international trade and navigation. When Dionysius Exiguus made his calculations, however, he used the only material available to him, in the form of the biblical texts. The Bible does not give a clear indication of the chronology anywhere in the accepted books which it includes, and Dionysius can therefore be excused for the error which he made. The Bible does state that Jesus was born while Herod I ruled over Judea, and it is now known that he ruled from about 20 B.C to 4 B.C (749 A.U.C.) when he is known to have died. The millennium celebrations, on that basis, should therefore have taken place between 1980 and 1996! It was many years ago, in 1970 to be exact, that as a schoolboy of 14 I saw and touched my first old document. I can still remember the excitement of reading the handwriting of a person born in the 1690s, and, what is more, a direct ancestor, which seemed to make his words come to life in an extraordinarily immediate way. It was a strange feeling to have such a personal link with someone who had lived so long ago; I was hooked from that moment onwards and continue to pursue my unfailing interest in family and local history through the original source material left by our forebears. My interest in the family history of the Ballards really originates from the time of my great Aunt’s death in 1969 at the age of 98. Aunt May was my grandmother’s eldest sister; she never married, and I can only just remember her. But she was a dear old lady who was fascinated by the past and her hero of all time was William the Conqueror. She loved nothing better than to visit old churches and she would go on long walks with her sisters in the countryside to seek out places of interest. Soon after she died, all her personal effects were sent round to an Aunt’s and I was lucky enough to help sort through them. Among her possessions was a box full of family papers and correspondence which I avidly devoured and photocopied whilst I had the opportunity. There were also some scrapbooks of newspaper cuttings, and a small album of photographs – all served to stimulate my interest in my grandmother’s family, especially as she had died many years before I was born. I was rather puzzled at first as to why Isaac started to make entries in a separate book when the family did, in fact, possess a Family Bible. Unfortunately, the bible and its owner completely disappeared during the 1880s, but not before my grandmother’s eldest brother, as a young boy, had copied out the many entries it contained. Nevertheless, the entries were quite sporadic. Although mention is made of an Isaac (or Richard) Ballard, Gent. who was born October 23rd 1567, it then jumps to the 1680s. The births recorded are those of Isaac’s brothers and sisters, although, strangely, Isaac’s birth in 1692 was not included; this may, of course, have been the fault of the transcriber who already had the information from the Register. Isaac’s Register records events as they actually happened, and in many cases the names of godparents at baptisms and the officiating clergyman. An early instance of the use of two Christian names in the family occurs in 1766, when Joseph Ballard’s eldest daughter was christened Elizabeth, with the addition of Balcombe, her mother’s maiden name. The high incidence of infant mortality is very apparent, but Isaac records these events with obvious detachment. This is surely a reflection of the times when all families expected to lose one or two children before they reached aduthood. In 1742 Isaac tells us: “I by a whip with a Twig a brushing hurt my left Eye and lost gradualy the Sight thearof.” On June 20th 1745, he records that “the Small Pox came out on Isaac, He living with Mr Davis at W. Farly was extream bad, came home the 23rd of August very weak, went again to Mr Davis Nov: 5.” Next year, on July 25th, Isaac “had an Ishue cut above my left Knee by Dr. Backet. Dryed up Jan: 1st 1765.” Issues, or running sores, were fairly common among our ancestors; his wife had a similar complaint in 1755. Unfortunately, erosion has worn away the rest of the inscription; but it obviously refers to Isaac’s burial in 1782, some 23 years after his wife. Joseph Ballard, who was born on November 26th 1728, was the seventh child of Isaac and Frances. He married Ann Balcombe in Cranbrook Church on October 4th 1757. In 1783 he was staying at Deal where, on August 15th he suddenly died, as the register records, “after comeing out of the Sea, where he had been bathing for the Comfit of his health. He was in the 56 yr of his age. Was buried in Deal Chappel Field. Josh. & James was there.” His tombstone, in what is now known as St. George’s Churchyard, records that “he was a Kind Husband and a Sincere Friend.” It would appear from the different handwriting in the Register that Isaac made his last entry in 1771, so he probably passed the Register on to Joseph at about the same time he bequeathed the old Family Bible to his grandson, Isaac. Perhaps increasing infirmity, especially poor eyesight, had something to do with his decision. His grandson, Isaac married Mary Pearce at Cranbrook Church on December 5th 1786, and so begun yet another generation of children to be recorded in the family register. In 1799 or 1800, Isaac and his young family moved to Sittingbourne where he took over the inn known as the “Rose”. To do this he had to show a certificate from the churchwardens and overseers proving that the family had lived in Cranbrook 200 years and had never received parish relief. Of their many children, William Ballard, who was born at Sittingbourne in 1801, was their eldest surviving son. He became innkeeper on his father’s death in 1822, but in 1832, soon after his marriage to Maria Osborn at Chatham, he moved to Chichester to take over the Dolphin Hotel. The Register came with him to Sussex, and he became the fourth generation Ballard to record the births of his children in it. William Ballard was a man of substance, with many commercial interests, and he remained landlord of the Dolphin until his death in 1868. In 1843, he was appointed Posting Master at Chichester; in 1857, he received a warrant signed by Arthur Wellesley, 2nd Duke of Wellington, appointing him Posting Master to the Establishment of Her Majesty’s Stables. Both these original warrants are still on display at the Dolphin and Anchor Hotel. In Kelly’s Directory for 1855, William is described as of the Dolphin Hotel, a commercial inn and posting house, wine, spirit and coal merchant, inland revenue office, and agent to the London and Brighton Railway Company. Both William and Maria were staunch Wesleyan Methodists and did much to further the cause of Methodism in the city. Maria’s brother was Dr George Osborn (1808-1891), twice President of the Wesleyan Conference and an outstanding figure in the movement. He was well known for his inspiring oratory and an able preacher. William faithfully recorded the births of his eleven children between 1831 and 1845 in the Family Register, and I am lucky to possess a photograph album containing pictures of virtually all of them, including their parents. Among them, born on January 31 1838, was my grandmother’s father, Adolphus Ballard (1838-1918). Adolphus married Frances Stafford in 1865, and on the death of their father, he took over the family business with his elder brother, George. Adolphus and Frances also had 11 children, but none are entered in the Register begun by his great great grandfather some 150 years previously. Unfortunately, not having seen the original document for 25 years, I cannot remember whether it was full or not, but I suspect it was. As far as I know, it is now in Australia with another Ballard descendant who is very keen on family history – so at least it should be in safe hands. I refrained from photocopying it at the time because I only had access to a machine which copied internally, and I dared not risk it. What if it should get stuck? But at least I had the sense to make a full transcript, thereby preserving the contents of this unique family record for future generations. I shall shortly be providing copies to the West Sussex Record Office and the Kent County Archives Office. Returning briefly to the Chichester Ballards, some six years after his brother George suddenly died in 1882, Adolphus sold the Dolphin to Henry Waite. Until his retirement in 1904, he ran an ironmongery business in East Street. Like his father, he was very active in local affairs, both in the Wesleyan Methodist Church in which he held all the various posts, and in the town council to which he was first elected in 1885. He was elected Mayor on two occasions, in 1896 and 1897, and in that capacity presided over Chichester’s local celebrations of Queen Victoria’s Diamond Jubilee. This concludes the story of the Ballard Family Register. Some time after I first saw it, I discovered that my great Aunt had written a short article about it during the 1930s, which was published in Archaeologia Cantiana. Though concise and to the point, it unfortunately says very little about the family. I hope I have rectified the omission by saying something of the people who continued to use Isaac’s book, thereby keeping alive the history of this family for future generations. Note: I have also extracted information for this article from a number of newspaper cuttings; all are contained in two scrapbooks, which belonged to my great Aunt. Unfortunately, they were not referenced and dated. Nevertheless, included among them are the Chichester Observer, Methodist Recorder and Oxford Chronicle.